-Suitable for one-off sealing security bags, express delivery bag, confidential bag, the garbage bag, the pet decoration bag and all kinds of plastic bags made of OPP, PP or PE materials. 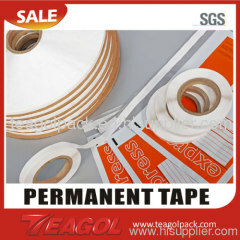 -Used in the low temperature function with excellent adhesive. Seal the bag tightly and can' t be for the second usage. -Nonpoisonous, harmless, no metal. Endure temperature. It is cold-resistant. ATTENTION: This sealing tape is not suitable for textile bag's sealing, for it would probably change the textile’s color somewhat the special adhesive ingredient and the dye material reaction for certain condition.